When it comes to my wardrobe, I definitely have a wide range of clothes from different price points. After reviewing my ever-changing closet, I decided to write about where you can save and splurge in your collection. Not everyone will agree with what I put on my list, but these items are just my opinion. When I started writing down my list, I made two columns, save and splurge. As I was looking through my closet and writing things down, I realized that there needed to be a shared column in my list. I understand that the list is just my opinion, but for some items I couldn’t pick because, of course, there were things that didn’t fit into either category. While there are numerous pricey coats out there that taunt me as I scroll through the Saks 5th Ave. website, there are equally as many, if not more that do the same at a fraction of the cost. My favorite coat this winter is my Aritzia puffer. It’s super warm, basic and easy to style, and significantly cheaper than it’s high end twin, a Moncler coat. Of course $200 is still a pretty penny, I think it’s worth it for a good quality and super warm coat that you can wear with essentially every outfit imaginable. If there is anybody who loves a big, cozy sweater in the colder seasons, I’d like to meet them. That being said, I don’t love shelling out hundreds for a sweater. One of my favorite places to go to when in search of sweater is H&M. 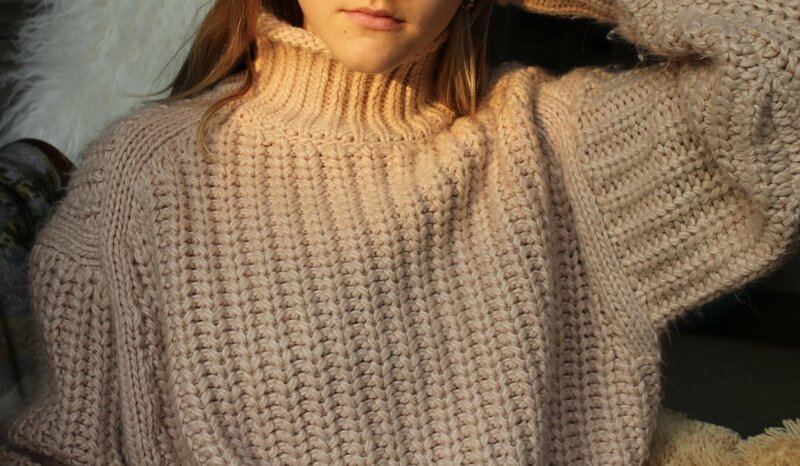 (but be sure you are checking the materials, because some can be scratchy and itchy) A good amount of my sweaters are from H&M and I wear them basically on a daily basis. One of my recent purchases that I’m loving is this chunky knit sweater from H&M. The quality of the sweater is great, much like that of a rag & bone sweater. T-shirts are a wardrobe basic any way you slice it, everybody wears one. If you wear t-shirts or know any teenage/preteen girl you’ve probably heard of Brandy Melville. Known for their inexpensive and generally pretty basic clothing, they are a cult favorite among basically any teen girl. Whenever I am looking for a plain white shirt or something with a small graphic, I go to the Brandy Melville website for an affordable option. One of my favorites is this baby angel shirt. It is a super cute and more affordable take on the Fiorucci angel shirts. Throwing on leggings and a hoodie is always a good option on a lazy day and I probably rely it too often. There are millions of cool hoodies out there and the good news is that you don’t have to spend a fortune on one. One of my current favorites is this Urban Outfitters floral hoodie. Urban Outfitters usually has cozy and affordable hoodies that will add a fun twist to your lazy day wardrobe pieces. I feel like there really isn’t a category that pants fit into. You can find awesome pants at Mango or at Zadig et Voltaire. Sunglasses are one of those things that you need to decide what you’re willing to spend on them. There are so many options and it really depends on whether or not you want them polarized and what you will use them for. What I usually do is spend more on my everyday sunglasses and then go for a cheaper option on my glasses that I use for photos. The same thing I said about pants also goes for dresses or skirts. There are so many options for dresses or skirts that suit any budget. It just depends on how often you wear them and where you are buying them from. Forever 21 has some great dresses and so does Reformation. A good pair of jeans are, in my opinion, worth every penny. They last longer, they are more comfortable and they age better than most cheaper alternatives. I also feel like there are more unique styles from a lot of the higher end brands. Some of my favorite places to shop are Reformation (specifically ones that look like the ones in the picture above), Free People, Frame, and AG Jeans. Belts are a pretty crucial part of my wardrobe and are one of the items I think it is justified to splurge on. You really only need one belt, therefore you can splurge on it if you feel you will get good use out of it. My favorite belt in my collection has to be my H belt from Hermes. I think that if you use a belt multiple times a week, it is a good use of money to invest in a quality one that will last you. Staple jewelry is just the pieces that make up your everyday collection, the earrings, rings, bracelets, or necklaces that you wear the most frequently. The pieces really depend on your personal taste in jewelry, but for me they consist of chunky hoops, round studs, my love ring, and my H bracelet. I wear these pieces on a daily basis and the reason I think it is okay to splurge on nice jewelry is because if you wear them everyday, you want them to last. If you are someone like myself, than spending a little extra on shoes is totally worth it. One of my weaknesses is shoes, I wear a different pair everyday of the week. That’s why, for a person like myself, it is fine. My favorite sneakers are my GGDB, which I wear all the time with any jeans. Like everything else I have said to splurge on, if you’re going to wear them often, it will probably be worth it. Another thing that I use everyday is a handbag. I generally change my bag everyday, depending on my outfit. Some of my favorite brands include; Zadig et Voltaire, Just Campagne, and Staud. A good bag is the perfect addition to any outfit and will easily spice up any look.